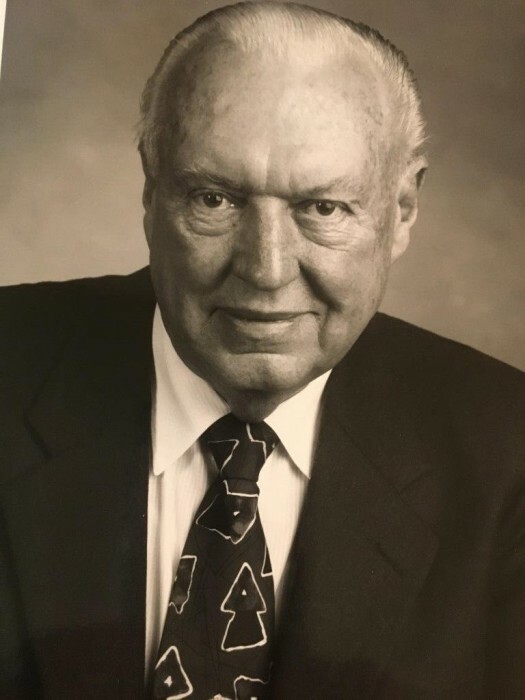 Thomas R. Becker passed away peacefully on January 24, 2019 lovingly surrounded by his family. Born during a two-foot snowstorm in Brule, Nebraska on December 29, 1924 to Andrew H. and Emma L. Becker, he was the youngest of three children. Tom’s family moved from Nebraska to Washington State in 1930 at the height of the Depression. During high school in Onalaska, Tom delivered three newspaper routes in the morning, played sports in the afternoon, and worked in a grocery store at night. In 1942, he joined the United States Coast Guard and began college at Massachusetts Institute of Technology. He was selected into the first Radio Engineering class of Long Range Navigators developed by MIT. During World War II, Tom served as Chief Engineer for construction of the Master Loran Station near Jupiter Island, Florida, Point Arguella, at Lompoc, California, and the Luzon Island of the Northern Philippines. He shared many memories from his service years including a flight across the Pacific to the Philippines when the engine caught on fire. For 500 miles, the plane continued flying at 1,000 feet. His return from the Philippines to San Francisco was upon the USS Typhoon. He married Silvia Bisi from Lompoc, California on May 12, 1946. Together they had ten children: five boys and five girls. All ten children were college graduates: 8 from Oregon State University, one from University of Oregon, and one from University of Portland. Tom and Silvia were married 40 years until her death in 1986. Tom and Silvia were very loving and supportive of their ten children. Together the family enjoyed holidays at Breitenbush, Timberline Lodge on Mount Hood, Canada, Hawaii and Palm Springs. They would load up the ten children along with the family’s dog, Buck, for camping at Tumalo State Park. Tom balanced a busy workday to attend every possible sporting event, school program and church service. In 1948, after World War II, Tom and Silvia moved to Oregon. He built and operated KNPT in Newport, OR. One of Tom’s first employees and lifetime business partners was Mo Niemi. Tom was involved with Mo and Mo’s Restaurants. He was President of Newport Pacific Corporation, owner of Mo’s Restaurants in Lincoln City, Florence, Cannon Beach, and Oregon Oyster Farms. Tom was a visionary for the Oregon Coast and creating jobs was his sense of purpose. A resident of Newport for over 50 years, he involved himself in many community service organizations. He was President of the Oregon Coast Association that promoted construction of the Astoria Bridge in 1958 alongside Senator Naterline of Newport. He was President of the Oregon Association of Broadcasters in 1968 and 1969. He was a board member of Oregon State University Foundation and a member of the Oregon State Beaver Club for many years. Tom was instrumental securing the 80-acre land for the Oregon State Marine Science Center and funding the initial feasibility study for the successful Oregon Coast Aquarium. Tom’s goal was to restore the salmon run along the Oregon Coast to provide jobs boosting the economy .He was influential in the development of the Undersea Gardens on the Newport bay front. He was a member of Newport Rotary Club, Newport Chamber of Commerce serving as President twice, and Charter Member of the Newport Elk’s Lodge. Tom loved sports and was an avid golfer, swimmer, tennis player, and snow skier. Tom married Shirley Keudell of Stayton in 1988 adding Shirley’s six children to the family. Living at Keudell Farms in Aumsville, Tom and Shirley graciously entertained family and friends for holidays, corn feeds, and barbeques. Together they had 43 grandchildren and 44 great grandchildren. When not at home, Tom and Shirley enjoyed traveling the world on cruises and tours. Being a devote Catholic with a love for Jesus and the Virgin Mary, many of their travels took them to religious Catholic sites including: Rome, Jerusalem, Santiago de Composstela, Spain, Britannia, Hungary, Medjugorje and even climbing Mt. Sinai. Tom is survived by his wife Shirley Becker of Salem, Oregon, nine of his ten children and Shirley’s six children: Tom (Maureen) Becker, Medford, OR, John (Jan) Becker, Newport, OR, Tim (Kim) Becker, Tigard, OR, Jim (Sally) Becker, Walnut Creek, CA, Mary Nolan (Tim) Fremont, CA, Anne Jantzi (Doug) Medford, OR, Jean Hilary (Jerry) Portland, OR, Margaret Grimsted (Brian) Vancouver, WA, Rose Reynolds (Pete) Newport Beach, CA, He had one deceased son, Michael (Trena) Becker, Lake Forest, CA., 27 grandchildren and 18 great grandchildren survive him. His is also survived by his wife’s children: Paula Smith (Royce), Allan Keudell (Patti), Larry Keudell (Janice), Steve Keudell (Sharon), Ron Keudell (Kimberly), and Craig Keudell (Kelly). Tom was preceded in death by his brother, James, his sister, Grace, his first wife, Silvia, and his youngest son, Michael. As a husband, dad, granddad or friend, Tom lived his life demonstrating the Greatest Generation: hard working, enthusiastic and humble. Tom was a great storyteller. He loved gatherings and activities that involved being with family and friends; to him the more the merrier. After these get-togethers, dad would say, “Wasn’t that a blast!” He was a natural leader, kind, loving, gentle, forgiving and always a gentleman. He loved people and people loved him; he will be greatly missed. Prayer Service: Thursday, January 31, 4:00 PM, Immaculate Conception Catholic Church, Stayton, Oregon.